Thanks, I need to try some Wilke Tobacco. It's on my list. And now, for something completely different..
Untwisted twist from an old farmer in Tennessee. This one should be fun. Press #3: 80g 75% Newminster Superior Round Slices; 25% D&R Picayune. Heated & pressed for four days. The Picayune was dry out of the bag; next time I use this, I’ll hydrate it some prior to mixing and heating. The puck is dense and adhering but mostly crumbles when sliced. This smokes as a very spicy VaBur. It might benefit from slicing and hydrating a bit prior to smoking, but it is not unpleasant at all as is. With my first whole leaf experiment, I just kinda scrunched wads of leaf in there. I wonder how the results will differ using nicely cut circles like that. the complexity of the blend. left it in the press for a week. It‘s pretty dense. I hope this time it’s going to stay that way. Rum Aroma in the tin is great like last time. I‘m currently airing it out and will try it in about 3-4 hours. #4 is in the press. Nothing too exciting. Late last night I wanted to get a batch going but wasn't feeling all that creative, but I did spy a jar of SPC Seattle Evening sitting there feeling a bit forlorn. It was getting toward dried out so I hydrated it some with a distilled water soaked paper towel, heated it a bit in the micro-wave and stuffed it in the Noobacco press. 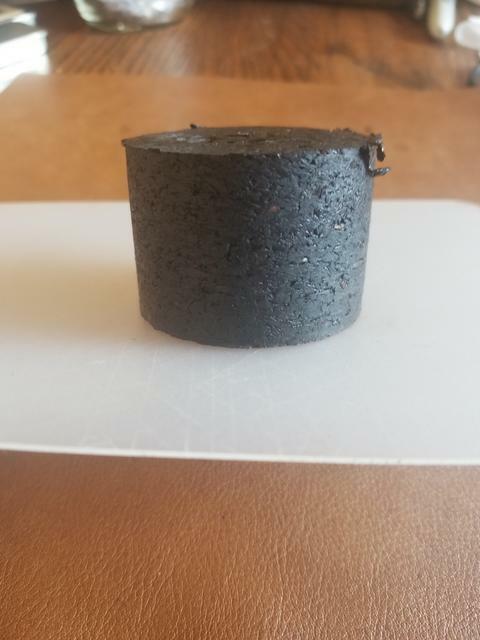 I think it was right at 50g, so it should be a thinner than normal puck. I'm going to have to lay in a supply of jelly jars to hold all these pucks. I did a pressing of D&R SJ rimboche, hydrated , heated and left pressed for a week. It came out great! Round 7 is out, this one is 2oz Sutliff Elizabethan Match, heated in the microwave and stuffed. 3 days, 3/4” exactly, nice and oily to the touch. I’ll be firing this one up later tonight.